The latest ‘superfood’ to throw into your smoothie or porridge is chokeberries, scientists say. The fruit, native to North America, is high in health-boosting antioxidants which can help in the fight against disease. It’s too tart to be eaten in it’s raw state, but Polish scientists found the fruit’s nutrients aren’t damaged when cooked into porridge – unlike some other fruits. But the berry, which looks similar to a cranberry or blueberry, may be difficult to get hold of in the UK because of low demand and a small market. Natural plant food sources are being developed into functional foods – such as breakfast cereals – so they have health benefits beyond normal food products. 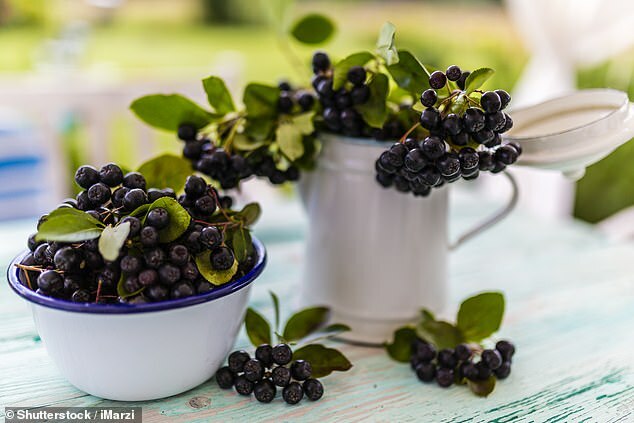 The team at the Medical University of Lublin in Poland were interested to see if they could create a corn porridge with chokeberries, also known as aronia berries. In addition to their high concentration of antioxidants, chokeberries are full of vitamins, such as vitamin C and flavonoids, the team said. It has previously been called ‘the healthiest fruit in the world’, is believed to have anti-ageing properties, be good for the heart and even work as an aphrodisiac. The team created porridge with varying contents of chokeberry added, with the highest one containing 20 per cent fruit. WHY ARE ANTIOXIDANTS GOOD IN THE DIET? Antioxidants are man-made or natural substances that may prevent or delay some types of cell damage. Diets high in vegetables and fruits, which are good sources of antioxidants, have been found to be healthy; however, research has not shown antioxidant supplements to be beneficial in preventing diseases. Examples of antioxidants include vitamins C and E, selenium, and carotenoids, such as beta-carotene, lycopene, lutein, and zeaxanthin. Vegetables and fruits are rich sources of antioxidants. There is good evidence that eating a diet that includes plenty of vegetables and fruits is healthy, and health officials urge people to eat more of these foods. Research has shown that people who eat more vegetables and fruits have lower risks of several diseases; however, it could be due to other healthy lifestyle choices. The results, published in De Gruyter’s journal, found that increasing the chokeberry fruit content made the breakfast bowl higher in antioxidants, polyphenols, flavonoids and free phenolic acids. The nutritional properties of the porridge samples did not degrade during the production process, despite the high temperatures used. The best time to eat it would be 10 minutes after making it, as this is when the fruit’s ability to clean up free radicals is highest, the researchers said. The researchers got their chokeberries from a local farmer in southeastern Poland, where it has long been popular. However, they are hard to come by in the UK, where there are only two or three growers. In Scotland, Thomas Thomson grows aronia in small quantities and supplies them to Tesco, where they are sold in small punnets. But due to the season of growth being very short, starting around September time, they aren’t on supermarket shelves for long. Melanie Thompson, director at the company, told MailOnline: ‘Due to limited knowledge on the berries, there is limited sales. Holland and Barrett sells dried ariona berries at £1.99 for 100g, and Greens Organic sell it in a powder £10.99 for 125g.